When I was a younger man, I served in the U.S Navy. I was a Signalman. Our jobs were to communicate with all the other ships in the Fleet we encountered while out at sea. We used Morse Code on flashing lights, Semaphore, and Flaghoists. We were also in charge of all the flags (Ensigns) on the ship; the Steaming Ensign, the Battle Ensign, the Quarterdeck Ensign and all the foreign naval and state Ensigns we maintained onboard. 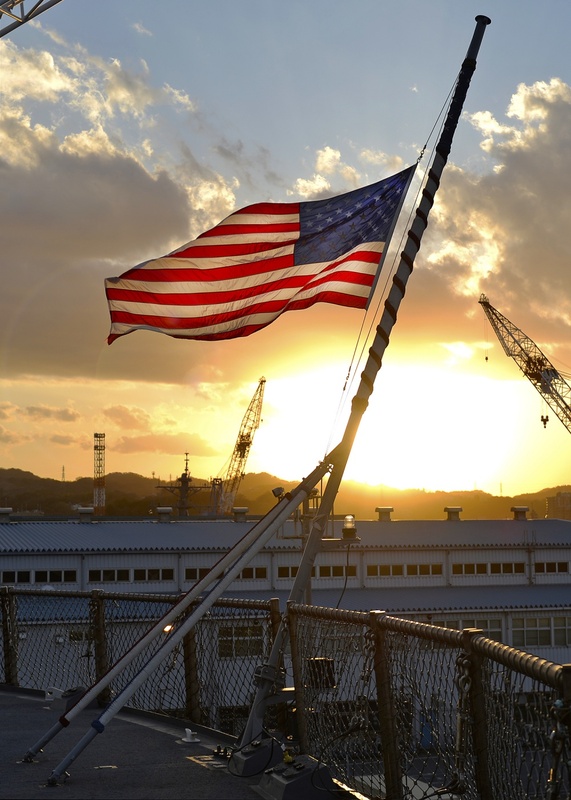 In port, we observed sunrise by hoisting the Captain and or Commodore’s absentee pennant. At Sunset, we observed Colors by lowering, folding, and storing the Ensign that was run up the sternpost. One day with our ship “underway” we sprinkled the ashes of a former Sailor over the side; “buried at sea” if you will. We produced a U.S. Flag, folded it, and put it aside so it could be given to the old sailors family. During the ceremony, more than one of us looked around at our shipmates and wondered if we would ever be buried at sea. Now when I drive down the street, and I spot the American Flag at Half-Mast, a voice in my head asks “why are they at Half-Mast?” Another voice in my head says “are you surprised? They’re always at Half-Mast.” “Oh yea, I say.” Now when I see flags at Half-Mast, I no longer pause to remember a deceased veteran or a community leader who just passed away. I no longer think about how their lives have enriched those around them. I don’t think of them at all. I only think about failure, and see a reminder of all the people who have died in gun violence. Failure of a broken system, a broken culture, and most of all, a broken country. I am no longer reminded about when the American Flag was part of my daily life and it stood for something more than the remembrance of so many innocent lives destroyed in apocalyptic fashion. Sometimes I even question whether participation in my own military service was broken. Sometimes I’m lost, but I have at least one idea that’s not broken; I want better lives for the people of this world. As Navy Signalman, there were often discussions on whether it was proper, appropriate, or code that an American Flag should ever be flown upside down, for any reason. The outcome from said discussions has proved inconclusive as well as the details of the “non-binding” U.S Flag Code. BTW, the U.S. Navy policy is the American Flag is NEVER to be flown upside down. These days it doesn’t matter. More so than not, if you see an American Flag at Half-Mast, it might as well be upside down; a dire indication of a nation in distress. Wow, a powerful post, ZD. One of your best. This is very thought provoking. I was in Jr ROTC in high school and in the army after that. In ROTC, we were responsible for raising and lowering the flag every day. On Fridays, which were uniform days, we had a big flag raising ceremony where the whole unit fell in at the flag pole. We were taught proper respect for the flag and in that day and age we hardly ever saw the flag at half mast. It was also a time when the horrible mass shootings were nonexistent. A sad commentary on our nation today.